Beauty and sinew wrapped up in one sweet package. We love the Range Rover Velar. Despite the fact that the Land Rover brand isn't exactly known for reliability, the Velar is truly great to drive and stunning to behold. It's sleek and looks different from the Range Rover, Ranger Rover Sport, and the Evoque thanks to a more elegant design. Now, there's a new Velar that's more powerful and luxurious. It's called the Range Rover Velar SVAutobiography Dynamic Edition. It's a mouthful, but it's worth the work. The SVAutobiography has more power than many sports cars. The "regular" Velar R-Dynamic HSE is already powerful enough, with an available supercharged 3.0-liter V6 that churns out 380 horsepower. The SVAutobiography gets a 5.0-liter supercharged V8 that delivers a potent 542 horsepower. It's developed by Land Rover's Special Vehicle Operations, just like the Range Rover Sport SVR and the Range Rover SVAutobiography Dynamic. In fact, the Velar SVAutobiography R-Dynamic sits between the two in terms of power. The key here is that the top-trim Velar is significantly lighter than either of those, to the tune of 350 pounds. That's like leaving two friends behind. 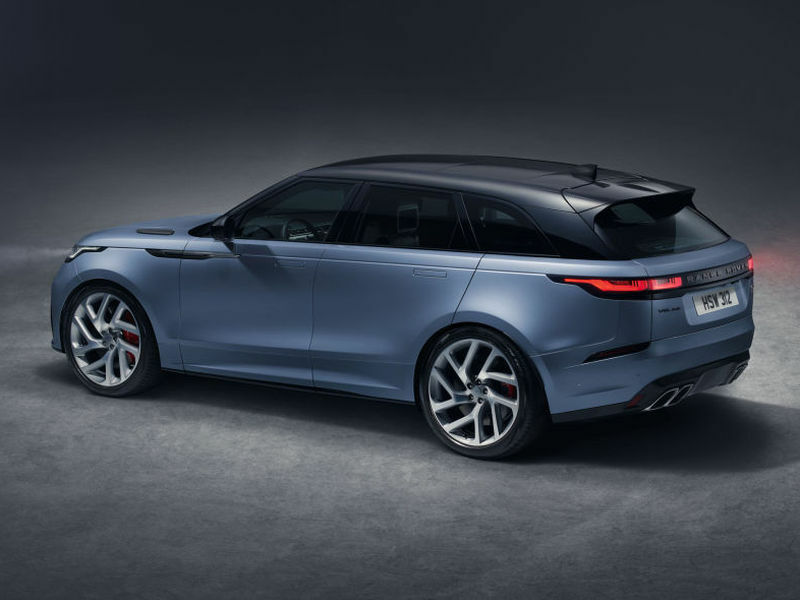 Land Rover claims the Velar SVA will be the most engaging vehicle to drive thanks to its power-to-weight ratio and changes to the software for the steering, eight-speed transmission, dampers, locking rear differential, and AWD system. There's a more performance-oriented air suspension, new brakes, and even a more robust transfer case for off-road shenanigans. Even the big 21-inch wheels are meant for performance (not just looks) since they weigh as much as the standard Velar's 20-inch versions. Those red brake calipers aren't just for show. They're more powerful than the standard ones. The style isn't radically different from the regular Velar, but there are some subtle differences that set it apart. The grille is new, and the air intakes are bigger. There's also a blacked out rear bumper, and exhaust finishers that surround the big pipes. Every model gets a Narvik Black roof for contrast against the six available colors. The one you see in these photos is an SVO paint hue known as Satin Byron Blue. The regular Velar gets 10 available colors but not the special blue paint. Though most Land Rover cabins are nice, the Velar's is especially so. The SVA version gets upgrades in the form of quilted and perforated Windsor leather with twin stitching in either Ebony, Cirrus, Vintage Tan or Pimento. The front seats are 20-way heated and ventilated versions. There are also knurled metal dials inside that match the badging on the exterior. The top screen (there are two in the Velar) also gets a knurled metal frame to dress things up. Lest your friends not think your Velar SVA is special enough, let them step inside. The top trim Velar R-Dynamic HSE costs $74,000 (base MSRP with the supercharged V6), so we expect the Velar SVA to cost significantly more than that. The Range Rover Sport SVR costs $113,900, and the Range Rover SVAutobiography costs a whopping $202K. We're guessing the Velar SVA will be much closer to the Sport SVR's price. It should go on sale later this year, and more specs and pricing will be disclosed at that time.